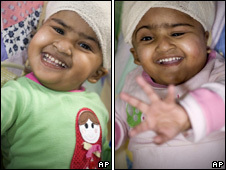 Two Bangladeshi girls, who up until last month were joined at the head, have left hospital. The twins made a much better recovery than expected from the marathon operation which separated them. 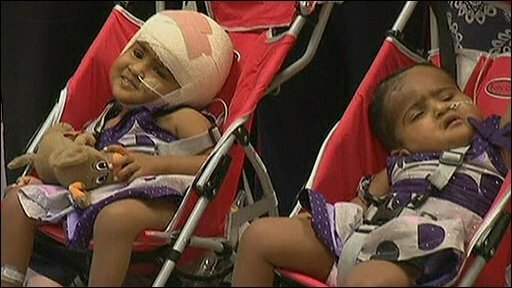 The former conjoined twins Trishna and Krishna have amazed doctors at the hospital in Melbourne where they were being treated. Both are now finding their feet, a change from their old habit of crawling round the floor. The twins were born with their brains fused together, and were given only a 25% chance of both surviving the operation to separate them. But they have amazed medics with their resilience and recovery, following last month's 32-hour operation. Doctors decided they were in good enough health to leave hospital to celebrate their third birthdays, their first as separate children. Brought to Australia two years ago, having been discovered by aid workers in a Dhaka orphanage, the girls are now expected to lead long and happy lives. It is believed they survived the operation without any serious neurological damage. Why are there so many conjoined twins in the news?